I find it so awesome and unique that Gary never asks for anything from his audience. The only thing he ever asks his audience to buy is his books and sneakers. Even then, he has made it clear that he doesn’t care if you go to your local library and rent the book instead of buying it. Whether it’s Gary’s videos, podcast, social media accounts, or books, he gives away all of his business secrets and then some, to his audience. This book is no different. I never read Crush It! by him, his first book (it’s a top priority of mine to read it). He has repeatedly said that he gets asked about this book the most. Even though it was published in 2009. Crushing It! is one of those books that you should read multiple times, maybe even once a year. For those of you that are not familiar with Mr. Vaynerchuk, he is an extremely accomplished marketer, businessman, and person. Out of everyone in the social media marketing space, Gary knows the most that I have seen — by a long shot. Crushing It! is Gary’s updated view on social media. He discusses the platforms, their future potential, and he also discusses upcoming platforms and Alexa skills (which is fascinating). 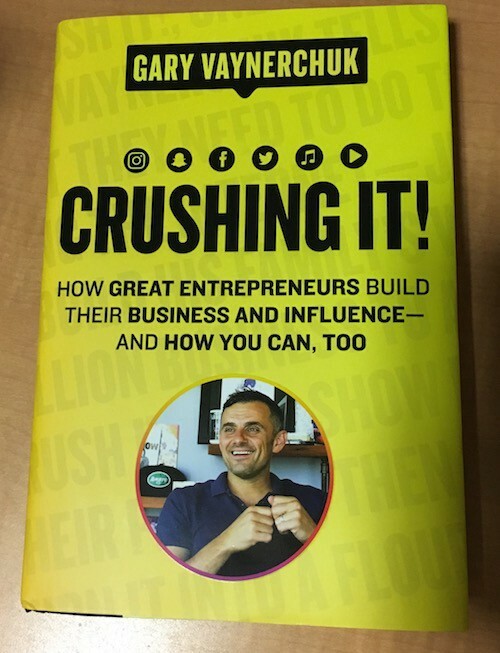 If you had no social media experience before reading this book, and then took Gary’s words and implemented them into your marketing strategy, you would have massive success in the social media space. Just by reading this one book. In part 1 of the book, Gary discusses how anyone can achieve success on social media. But it all comes down to the one constant — mindset. Everyone has something they’re passionate about. Whether that is knitting, graphic design, golf, sneakers, and so on. In part 1 of the book, Gary discusses how you can turn your passion into money with the use of social media. There were numerous individuals included in part 1 of this book that did exactly what I just said — they turned their passion into an income through social media. One of the individuals had a passion for fashion. He and his friend ironed the word foolies onto white shirts. They would put the shirt on one person, take a picture, and then take the shirt and put it on another person. Then they would take those pictures and post them on Facebook and Twitter. They built awareness that way. Within 2 hours of this post, he was getting share after share on Facebook all because 2 of the women mentioned in his post, shared it with their followers. One of the women suggested that he should make a T-shirt with that graphic on it, but little did she know that he already had a T-shirt company. From this point on, Alex’s company was never the same. It took off from there because social media gave him the opportunity to cash in on his passion. That is just one story of how social media can turn your passion into cash. Part 2 as I mentioned before, is about the platforms. Musical.ly, Snapchat, Twitter, YouTube, Facebook, Instagram, Podcasts, Voice-first. For each platform, Gary gives his thoughts about the platform and also gives examples of what kind of content he would post for each individual platform. Also included: stories from others who have used that specific platform and how they used it to grow their brand and increase their income. These individuals give you the strategies that they have used for their success, so you can use them for your success. If you are eager to get an up-to-date look at the social media platforms, look no further than part 2 of this book. Absorb the information being told by one of the greatest social media experts to walk this earth. If you’re looking to up your game in social media, then read this book. This may be the only book that you need to break through on social media. The information is all there, it’s just a matter of you executing.